If you're going to get dolled up for a Broadway show, you better doll up your plate too beforehand. With the start of this year's Broadway shows at Segerstrom Center for the Arts today, Leatherby's Cafe Rouge is releasing their season's set of inspired themed menus per show. It's an innovative tradition of theirs and one that puts Executive Ross Pangilinan's artistry to the test as he examines each of the upcoming shows to determine what to fill the set list with. The installment of three-course menus is usually based on the music and characters of the shows to get patrons into the mindset and mood of the storyline before enjoying the performances. 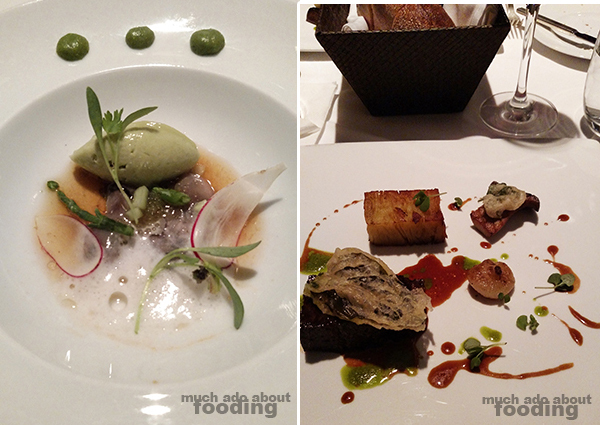 The selections are quite carefully curated and after I was able to preview some dishes from this series, they proved to be masterfully executed as well. 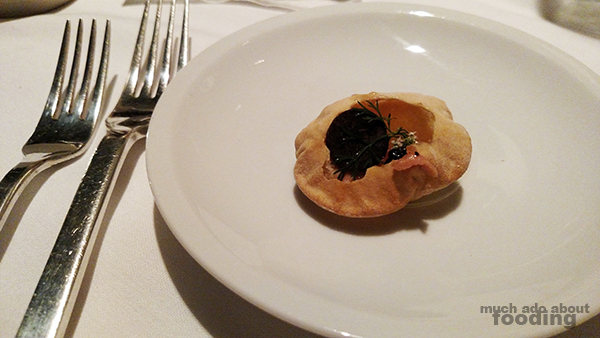 To begin, an amuse bouche graced our plates; it looked like pani puri but was filled with something quite different. Quince paste and a pat of foie gras filled the hollow bread bite - a delectable start. Act I that evening was inspired by Guys and Dolls (runs April 14-19), particularly "A Bushel and a Peck" demonstrated as a West Coast oyster cocktail with spicy ponzu, citrus caviar, cucumber, sake, wasabi tobiko, and avocado sorbet. The name brought together the imagery of how the ingredients are sold to restaurants in bushels and pecks. Bright and refreshing but with enough savory weight, this dish was a perfect start of what was to come. Act II stemmed from Nice Work If You Can Get It (runs March 17-22) and was inspired by "Will You Remember Me?" 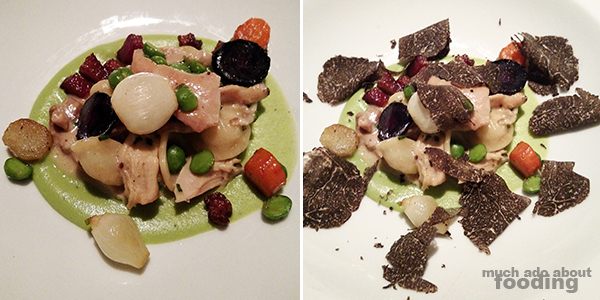 which was quite the memorable dish itself - rabbit braised in local beer (Ballast Point Sculpin when we had it) and grainy mustard with orecchiette pasta, peas, bacon, carrot, and pearl onion. Freshly shaven black truffle, when in season, can top off this beaut of a dish if you ask for it. 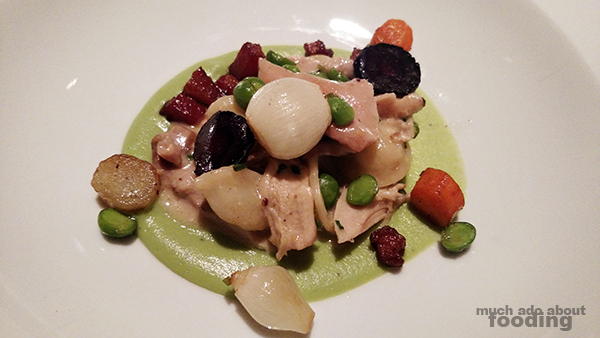 Tender and succulent, the rabbit shone with its hoppy braise and the pea puree was stunning. I will remember you for sure, dear dish. 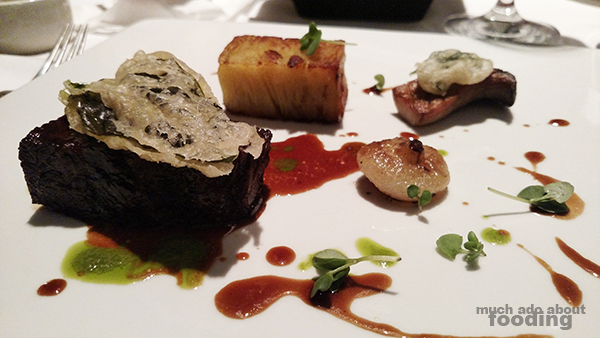 We then moved to Act III which was motivated by Annie (runs May 13-24) and "N.Y.C.," demonstrated through a bacon-wrapped East Coast monkfish with apple-celery puree, tomato-onion tart, and buerre rouge. Perfectly cooked, the fish was an impressive bite and highlighted well through the apple-celery puree. The tomato-onion tart was just large enough to be a formidable but not distracting component of the dish. Delish. What were the inspirational factors? NYC is often nicknamed the Big Apple (puree), and the constant incorporation of the red color was a tribute to Annie's well-known head of hair. Are you a fan of Dirty Dancing (runs February 3-15)? 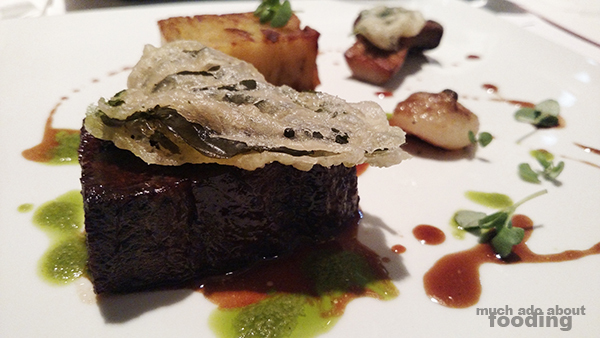 It seemed like everyone was so eyes were wide for Act IV's "Hungry Eyes," the CAB boneless beef short rib with Yukon gold potato pave, king trumpet mushrooms, cipollini, herb tempura, and natural jus. The potatoes were worth prancing about for as they maintained a perfect balance between soft and crisp. It was all to prepare for The Final Act of Motown (runs June 16-28)'s Berry Gordy (chilled "berry" soup, pistachio panna cotta, and waffle cookie) that was a little interactive. Rounds of pannacotta were swiftly surrounded by the sweet soup that had a hint of tartness. The pistachio's nuttiness really shone here.